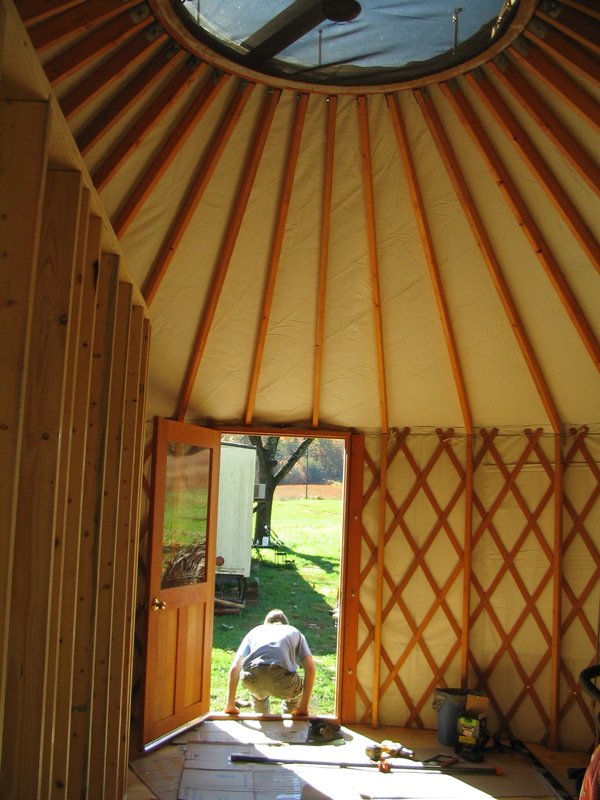 The day after the yurt raising. Still a lot of work to do. We rolled up the windows to see what that was like. It’s kind of a process, and you have to get on a ladder to do it. 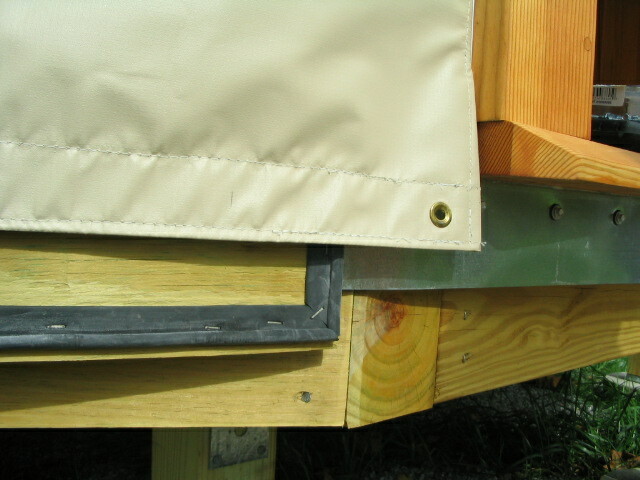 First we had to adjust all the insulation panels, then attach the L brackets which connect the lattice with the floor. 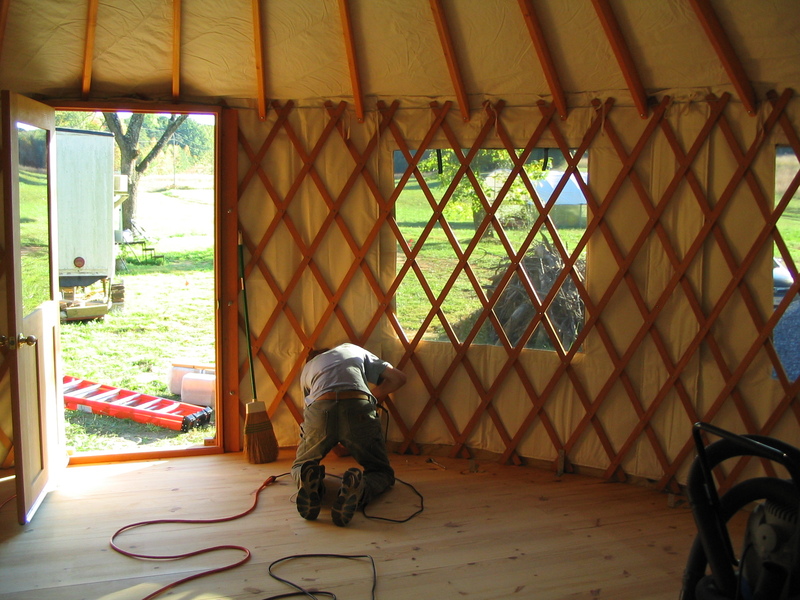 Here you can see the interior view with the windows open. Next Gavin did a quick final sanding with a hand sander, one last vacuuming, and then the oil finish went on with a rented buffer. We decided to close up the windows until we move there. There is a lot of light coming in from the dome and the windows in the doors. 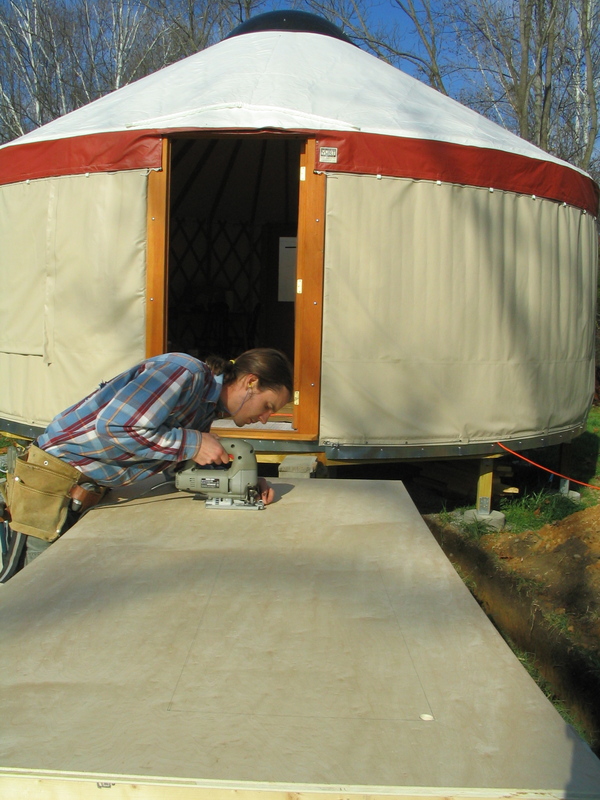 After the floor was finished, we set up the futon and kitchen table for a more comfortable camping experience. 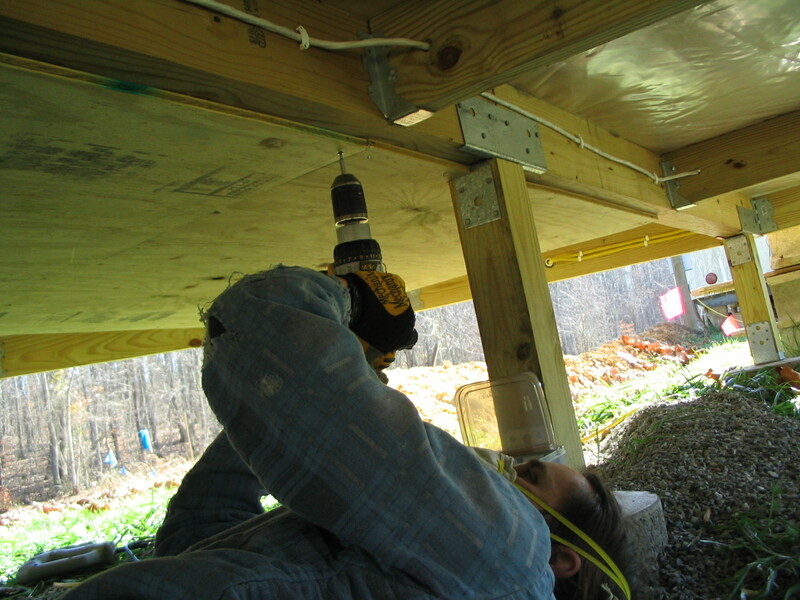 Here Gavin is putting in the studs that attach the rafters to the floor and provide added snow and wind bracing. The studs are all in. The dome acts as a sundial. 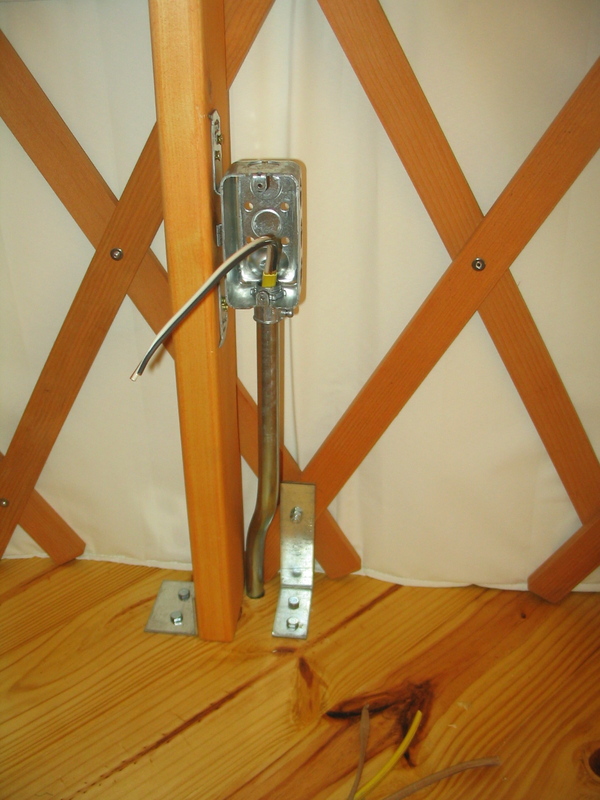 Gavin attached some galvanized flashing beneath the doorways with roofing screws. It looks great! 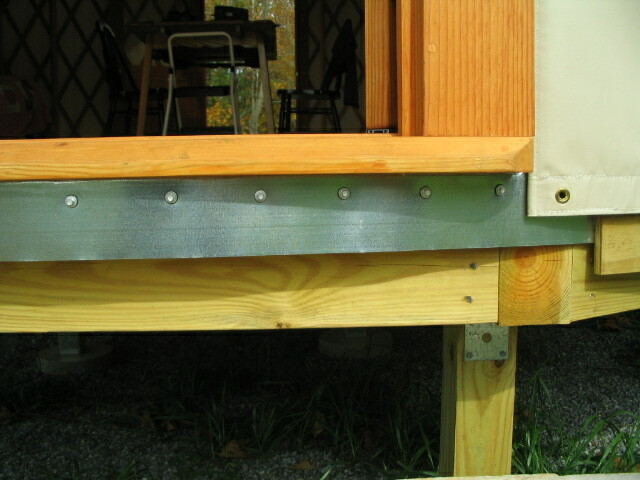 We put some weather-stripping on the bender board before adding the galvanized flashing. Here is the bender board with the flashing on. 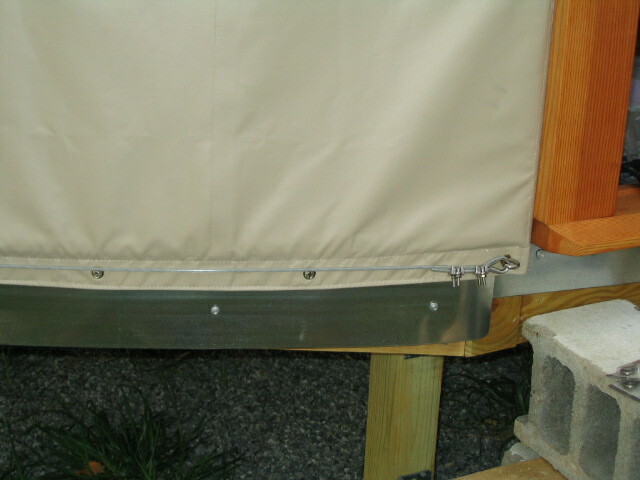 Also the side wall is screwed in and pulled tight with a cable. We put more weather stripping up underneath the bottom of the wall. 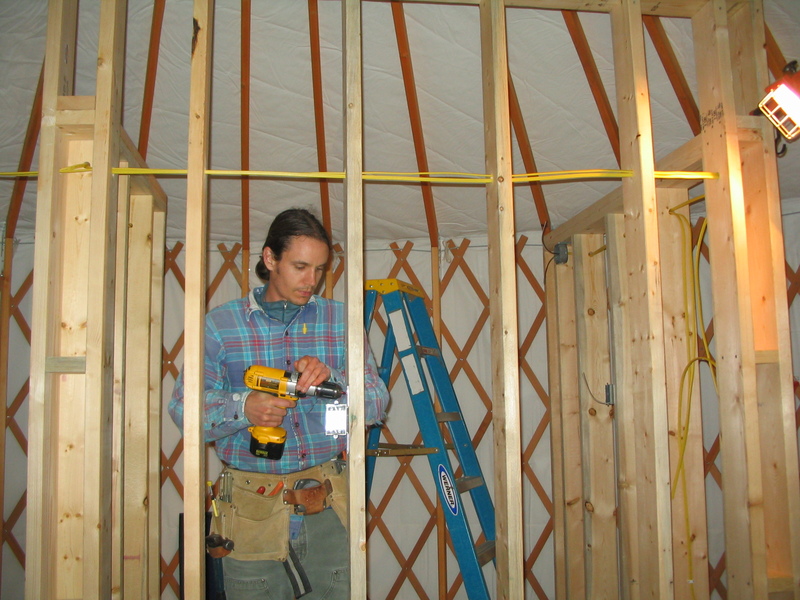 Framing the partition wall. 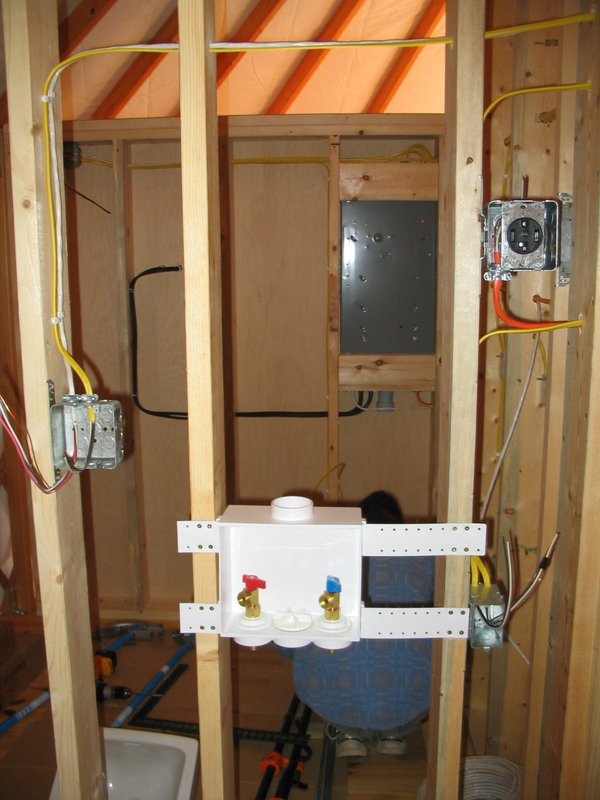 Almost all the electrical and all the plumbing runs through the bathroom enclosure. So you can see the placement of the wall, it basically divides 1/3 of the space off for the bathroom/laundry area. Inside the bathroom. 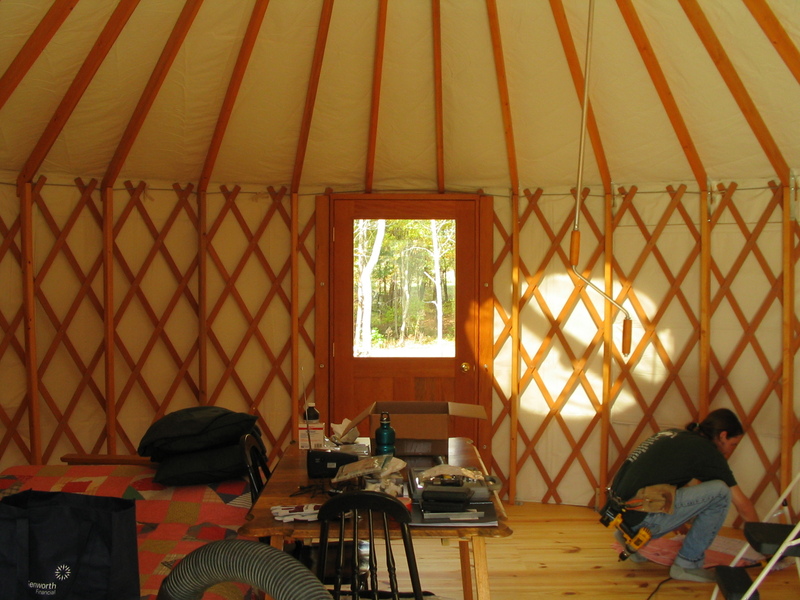 The two walls are different heights because of the roof slope. 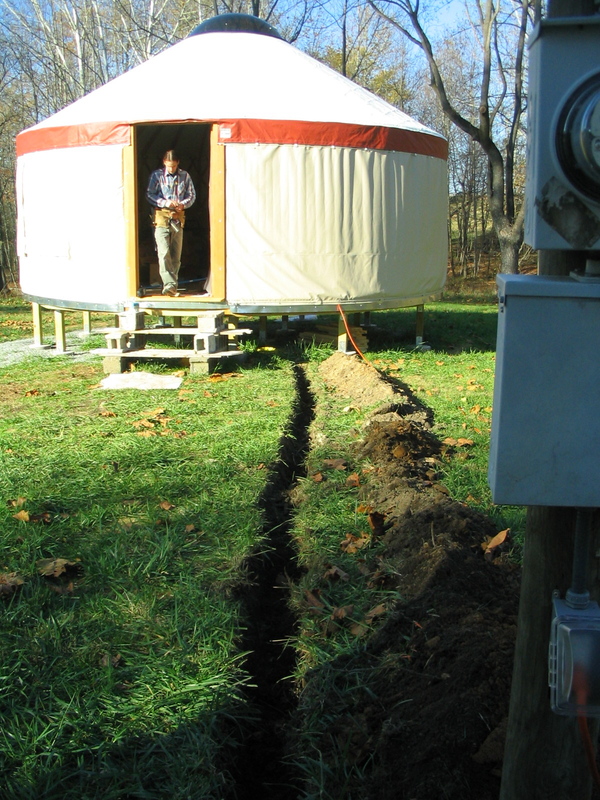 We dug a 2′ deep trench from the existing electric pole to underneath the yurt for the electric line. Since we have no exterior walls to put the outlets in, Gavin put the wires in electrical conduit and attached the boxes to the studs. 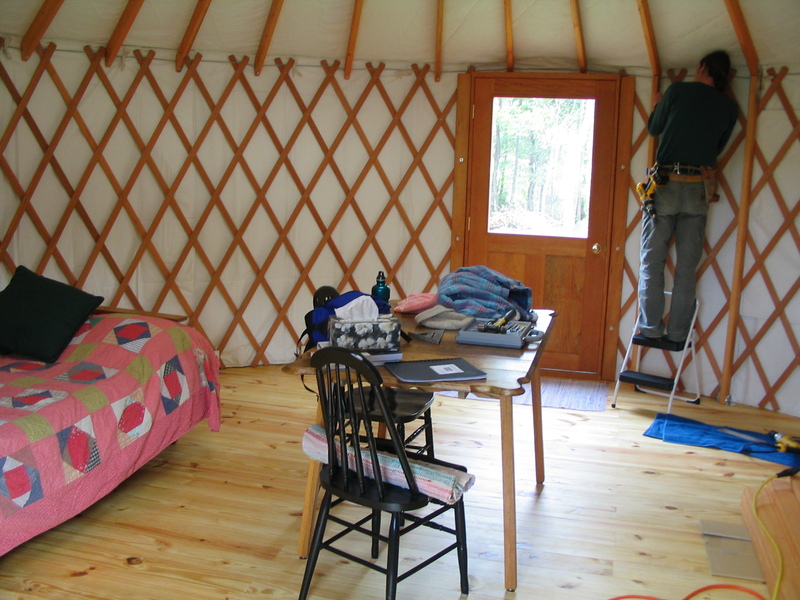 We chose to use a no-formaldehyde-added plywood to sheath the walls. It is made by Columbia Wood Products and we chose a shop grade maple veneer. 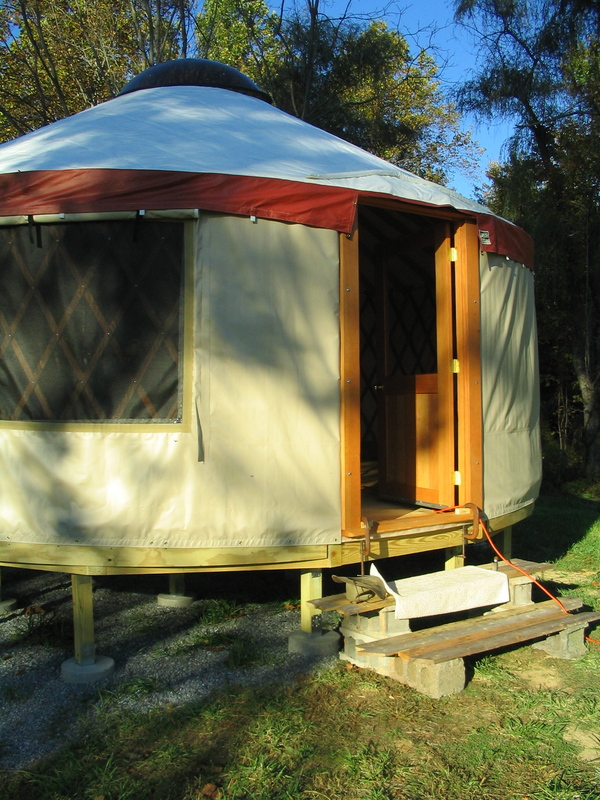 Apparently there is no such thing as no-formaldehyde plywood, because there is formaldehyde naturally occurring in wood, but it is very minimal. 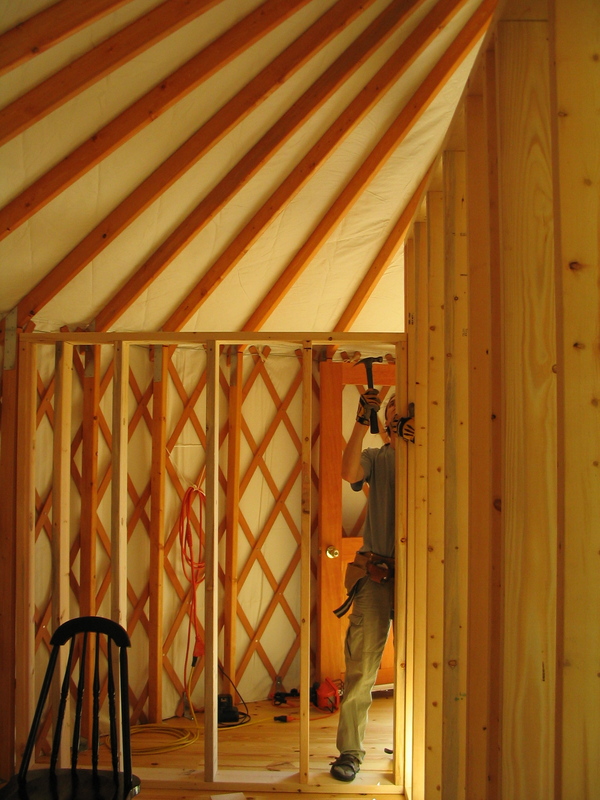 We didn’t want to use drywall because it would be a dusty mess in the yurt. Also we didn’t want to have to paint the wall. 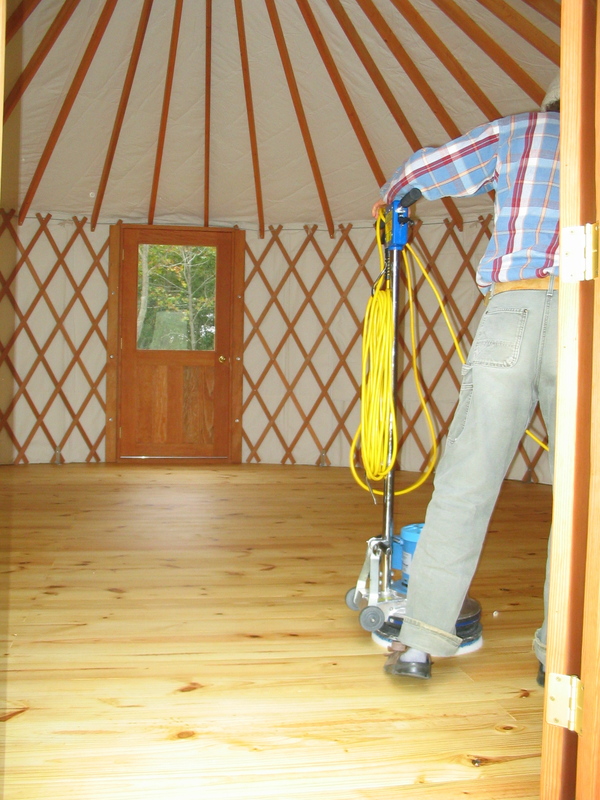 We can finish the plywood with the same oil we used on the floor, Rubio Monocoat. 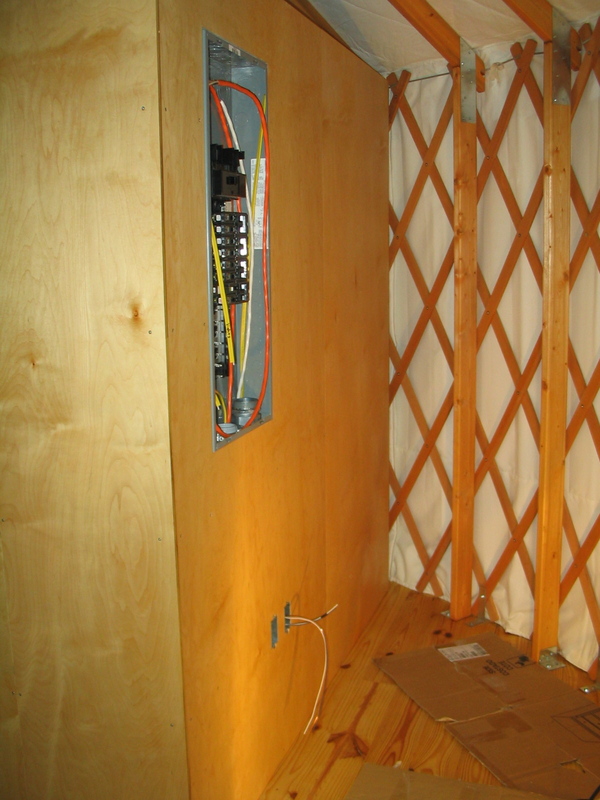 Here is the enclosure wall attached, and with the finish on, and you can see the electrical panel recessed in the wall. The electric panel and on-demand water heater which is extremely space-efficient. 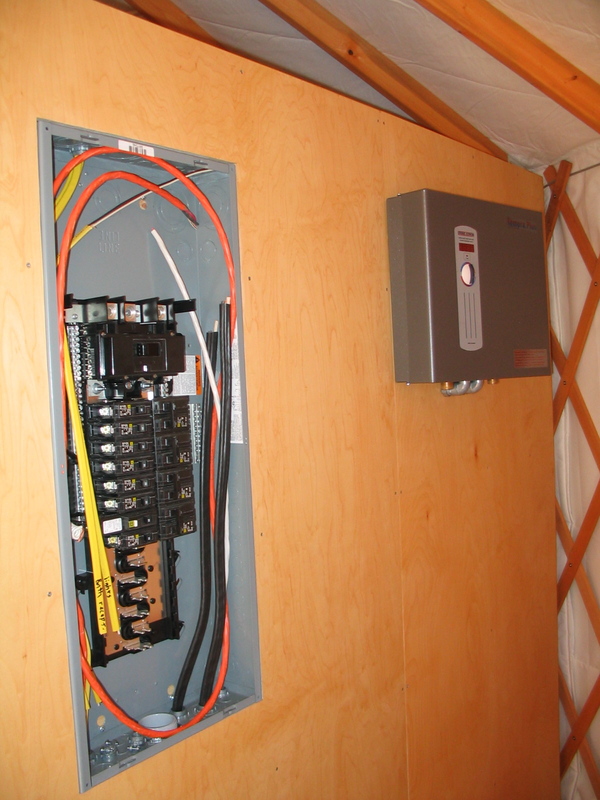 Here you see the dryer plug, washer connections, and more electric boxes in the bathroom enclosure wall. 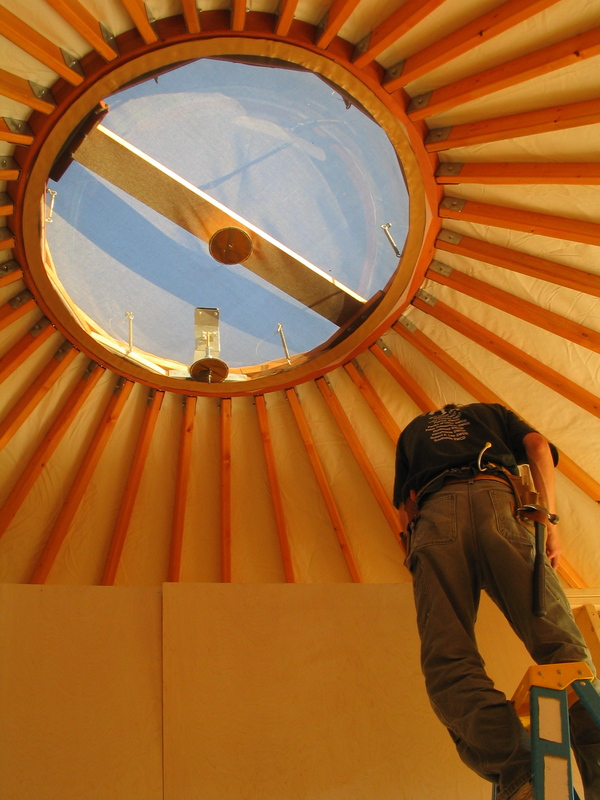 Gavin is attaching plywood underneath the yurt. 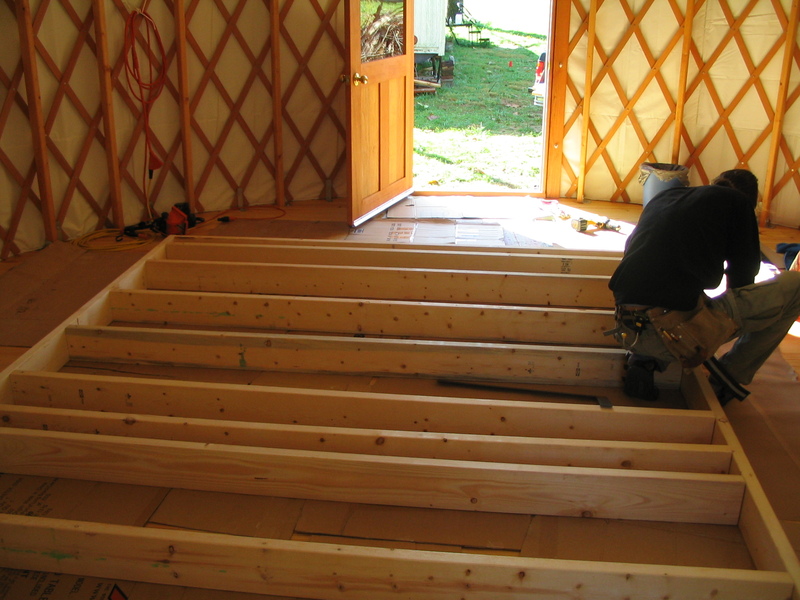 We will fill the cavities with insulation. 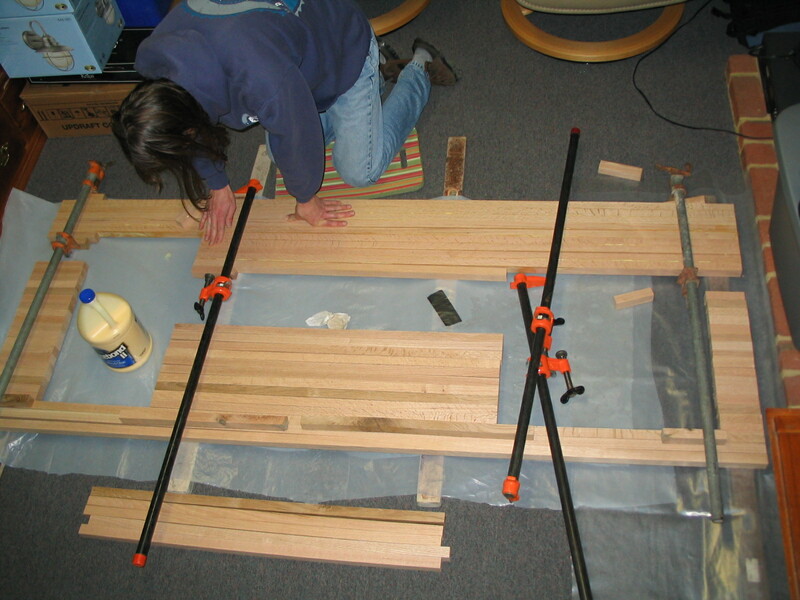 Gavin used some oak he had lying around to cut into strips and glue together for the kitchen countertop. 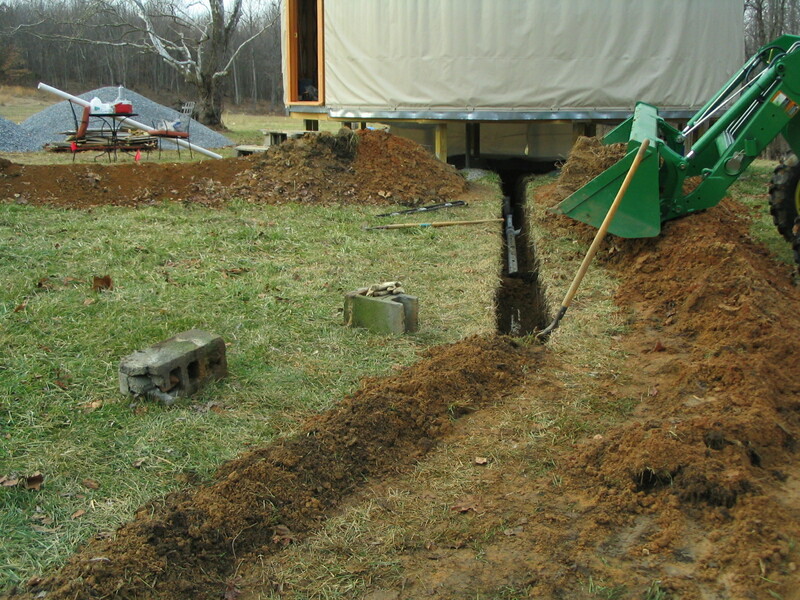 The trench for the waste pipe. Wow! Again! I loved the snow while the plumbers were at work putting in the pump. It all looks so shiny and new! Which it is, but it’s fun to see. And am so glad I’m not doing all that work! Kudos to you two! I was getting ready to show Curtis the blog after putting it in favorites and saw that you had added 3 more portions! You stay busy!